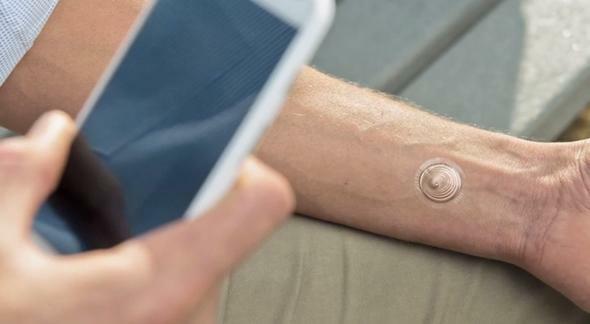 A temporary tattoo to unlock the Moto X made by Google and VivaLnk Inc.
Unlocking your smartphone just got easier. Locking your smartphone is important for securing your data in case of loss or theft, but lots of people don’t do it. Why? Because it’s annoying. Entering a pin or drawing a design gets old when you check your phone a million times a day, which you do. So Google wants to make it easier. What if you could have a tattoo that unlocked your phone? It sounds great but also scary. Is it an implanted chip like in every sci-fi movie ever? Is it a tattoo drawn with really metallic ink? Time to chill out—it’s a temporary tattoo. It sticks on! Based on super thin and flexible electronics like VivaLnk’s eSkinTM tech, the tattoos use the same near-field communication that you might have heard about in mobile payment systems to unlock your Moto X. They stick on anywhere and are about the size of a nickel. They adhere for roughly five days through showers, workouts, and anything else, and Motorola employees say they’re actually comfortable (though it’ll be good to hear from impartial testers). The tattoos are available from VivaLnk in 10 packs for $9.99, so it’ll cost $80 to cover a whole year of tattoo unlocking. Motorola says it takes average users 2.3 seconds to unlock their phones, and they do it 39 times a day, so if your time is valuable enough, tattoos may actually be a bargain. At the very least it’s a good conversation starter that isn’t quite as … aggressive as Google Glass. Or as permanently laughable as a QR code tattoo.